We’ve been in the shed business for so long that we sometimes forget what it’s like when you’re getting your very first storage shed. It may seem like a simple procedure but so you can make the most out of your investment, read through Our Beginners’ Guide below to make sure you’ve covered all your bases. Take a few minutes and consider each of the questions we’ve come up with for you. By the time you’re through, we guarantee you’ll have a crystal clear idea of what you’re looking for. Step 1. What will you be using your new structure for? Instead, they first notice they seem to be collecting a bit too much stuff. Their garage may be getting harder and harder to park the car in. They’re afraid to open the closet door because all the things crammed in it may landslide out on top of you. Whether it’s to clean out the garage or the basement, getting your own storage shed is like getting a brand new room with over 200 square feet overnight. If you’re a property owner, you know first hand how much lawn and garden equipment you need to keep your curb appeal fresh. Riding mowers, push mowers, potting soil, rakes, shovels….all that needed equipment takes up space. So rather than trying to squeeze them into your garage, or down stairs in the cellar where it’s hard to get to, a Storage Shed positioned just where you want it can make your own landscaping all pleasure and no pain. Make sure you ask as us about the specific options we’ve created just for lawn and garden equipment. The do it yourself carpenter, craft booker or sewer who truly enjoys their hobby almost always gets their money out of a storage structure when they use it as a workshop. Instead of having to keep your tools and supplies packed up and dragging them out each time you want work on it, a storage shed used for a workshop will let you leave your supplies out so you can come and go as you please. Hobbies are supposed to be fun, right? By having a separate designated area for your workshop or hobby room, we’ll be you’ll be more motivated to work on your crafts. Rather than a costly construction project, one of our pre-made storage sheds can be a faster, more affordable way to add another room to your home. We’ve seen folks use their storage sheds as home gyms, an office, or a secret get away. By choosing the right options (we’ll talk more about that later), you can create an exterior and an interior that won’t look or feel like a shed at all. Are You Renting a Storage Locker? Investing in your own storage shed can pay for itself in a matter of months. And after you stopped paying money on storage locker, then your shed is actually saving you money! And just think how simple it would be to walk a few steps to the back yard to get your treasure rather than spending gas driving 20 minutes to your local storage shed locker. By far the most common “complaint” we get from our customers is “I should have listened to you and gone with something bigger.” There always seems to be more stuff you want to put into your new storage shed than when you originally thought. It make sense- by the 2nd or 3rd weekend, when you really start appreciating you can park both cars in the garage again, and you get use to having a neat and orderly home because you have everything organized in your storage shed, you probably will think of other things you want to store in it. Step 2. How Much Space Will You Need? After you know what you’ll be using your new storage shed for, make sure you have a good idea of what you’ll be putting into before you go shopping. Try to have an idea of how much you will be storing so you can make sure you will enough space. The eye can play tricks on us- what you “think” will fit into your new storage shed may not all get in there. To combat this, create a list of everything you’ll want to put into your new shed and compare that to our “Guide to Square Footage” below or bring your list in with you when you come to our Display Lot and we can advise you on which space will meet your needs. 8’ wide x 12’ long good for small back yards, don’t need a lot of storage. A Riding mower here would be a tight fit. The smallest structure- a 6’ wide by 8’ long are less than 50 square feet. 10‘wide x 16’ -160 square feet works well for nearly all our customers. Most popular size. Fits all the important items but not a lot of room to walk around. Pay special attention to where you will you place your riding mower. 12’ wide x 20’ long is the best seller in the large shed category. If extra space to walk around is important, or you want some left over room for a functioning workshop, going with this larger size won’t disappoint. 14’ wide by 28’ long are the dimensions for our popular 1 car garage model. Two car garages can be as large as 24’ by 36’. Step 3. What Style Do You Like? You’ve spent all that money and time on making our home a real show place. And depending on where you place your new storage shed, it could get just as much “curb time” as your home. Make sure not to detract from the appearance of your home and property by not paying attention to the appearance of your structure. You can select from over 11 styles to compliment it in a truly unique way. Match roof lines, materials, door and window combinations- make sure you know all of the free choices you have to select a beautiful storage structure. For a full range of choices, check out the list on the left side of the home page. This style is our "can't go wrong" pick. Good storage capacity with a fresh look. Consider a Dutch barn if you have a lot of smaller boxed items that can fit on a loft. Top of the line in appearance. When the appearance of your structure is just as important as its function. Sometimes called a Victorian, the only style that has the third gable on the front above the door. Comes standard with double doors and 3 foot front door. Free standing garages pre built and delivered to your site for a lot less than having one built. The Single vehicle garage can be set up on your property to store the extra car sitting in your drive way. Many of our customers purchased a single vehicle garage to store their classic car or boat. Able to add a full sized work area to the length of all sizes. The sloped back roof line does limit the head room in the back of the shed. The only style with 4 sides to it with a cathedral ceiling feel on interior. When budget is more important than looks. Once your style is selected, review the many choices you have for the different parts of your structure. Start at the roof and work down: different shingle choices in either our 25 year warranted or upgraded architectural shingles; select from painted wood color choices or vinyl sided selections. Interior Decorator Will Hapeman, known as “The Decorating Coach” advises you try to match the roof/shingle colors as close to your home as you can. “It may not be an exact match, but from the street- try to get something that is close. Whatever you do, avoid going with a roof color that is clearly a different color- like tan colored house shingles and black colored shed shingles”. The Decorating Coach Will explains how to choose a siding color, “You can either match the siding on your home to the vinyl siding on your storage shed, or you can coordinate it.” Matching is pretty easy- you may want to go down to their retail sight and take along a small sample of your house siding to eyeball it up. Then match the trim and shutters up to your shed exactly. For example a nice, classic white sided home with black siding/shutters probably would be best suited with a storage shed that is in the same white color with black accents. 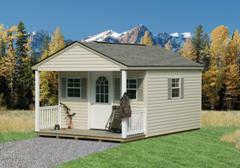 For a full range of the color choices you have, check out Designing Your Shed/Options next. For all the color choices, click here. Step 5. What Options Do You Want? A lot of first time shed buyers (and returning ones too) don’t realize that your selection is not limited to what you see on our Display lot. We encourage you stop by so you can get an idea for the square footage and see the different styles, colors and options you have. BUT if you don’t see something you like- you can create your own. Work with our trained team and we’ll help you create your own- 1 of a kind- storage structure made just for you. And most of the times, customizing a standard storage shed doesn’t cost one penny more! Storing gas or paint cans? Then our ridge vents and end vents for example will give you that much needed circulation. Storing a riding mower? Make sure to measure the full width of your tractor against the opening in the doors. And make sure to ask about the ramps we offer. And if your structure is intended to do double duty- like part storage and part pool changing room- at least find out how much a partition or wall would be. We can guarantee you’ll be surprised when you learn what choices you have that are included for FREE with your storage shed. And for a few dollars more, you can get some really functional options added to your structure to make it your own- like shelving units installed at the time we make your shed for you. Thinking about adding your options yourself? We applaud your great intentions but just make sure you will eventually get around to doing them. We’ve seen so many sheds with everything heaped on a pile in the floor because the well meaning home owner never got around to installing those simple shelves or that overhead loft to create more storage. So when shed shopping, at least find out what these “must have” options are going to cost. You’re now ready to go shopping! As mentioned above, we encourage you to stop by our site so you can see first hand what the different sizes, styles and colors are like. Then you can stroll through our display to see if you find anything that matches everything on your list. Remember anything from our big assortment currently in stock can be delivered quickly. Don’t see what you want? You can really have a 1 of a kind structure by custom creating one. There’s never an extra charge for custom ordering a standard structure. There could be a few week wait, but we’ll need some time to hand build your shed exactly the way you wanted it. Want to download the “Beginners Guide Workbook” that goes with this? While you wait for your shed to be delivered, make sure you to put some thought into where on your property your new shed will go. Consider how your property will look with your new addition, balanced between how close (or how far) you’ll want it from your home. Make sure you speak with us about some important preparation work that site needs before we can deliver. Learn more about this by clicking here "Preparing For Your New Shed"
Step 8. Your New Shed is Delivered! We normally can deliver and set up your new shed in a few hours, so be ready to clean out that garage and attic and reclaim some space! There- you just added square feet to your home in one afternoon. Since you followed the instructions in our Beginners’ Guide, you should be ready to play ball. Using post it notes or labels, indicate what each shelf or loft will be used for. Pay attention to the spaces that will be easier to get to- those should be the new home for the items you’ll be using on a more routine basis. Seldom used items- like Outdoor Christmas Decorations should go in a harder to reach area of your new storage shed. If you are storing lawn and garden equipment, consider putting them along the interior walls to take advantage of every square inch. Fill up the smaller spaces along the wall and overhead first before moving in your larger items like pulling in the lawn mower and snow blower. You’re going to need the space to move around setting this part up. Now work on the garage or closet or basement. The first thing you need to do is throw away any junk that is laying around that you never use. Only keep the items that are absolutely necessary! Adopt the rule that it if hasn't been used for 12 months, it is probably not needed (except for very expensive equipment or if you have been too ill or work-swamped to get to a hobby). Go through all of your stuff and organize it into piles. Decide which sections or piles will go into your new storage shed. For example, tools, Christmas ornaments, collectables, etc. Be methodical, as the more things that you can place together in related groups, the easier it will be to see what you want to keep, what you have in duplicate and what you no longer want or need. Move the piles that will go into your new shed. You may want to consider some of those oversized plastic storage containers if you have many smaller items. Your garage (or closet or basement) should instantly look better! Now might be a good time to get the broom and hose for a thorough cleaning. Lastly, take the unwanted items to donate to charity, to a recycling center or to the garbage dumpster. Or use your garage to have a garage sale! Let someone give you money to take your unwanted stuff and put it in their garage. Click Here to Download the Beginners Guide Workbook that goes with this. The Beginners’ Buying Guide to Storage Sheds lets you answer these questions and keep all your wishes and wants organized in one place.